Zoey and I picked out the new Scarlet Creative house from Collabor88 called The Emily. The new house was rezed and we set about decorating. Second Life house decorating has a completely different set of adventures to it than real life house decorating, only because everything is aesthetic rather than practical. We have a couple of “dead rooms” in the house, because they don’t really serve a practical purpose. I decided, for now, to turn one of those rooms in a yoga room. I’ll probably use it for photography in the long run. Many of the objects for the room are ones that I purchased at Collabor88 a few months ago, when they had a gym/workout theme. 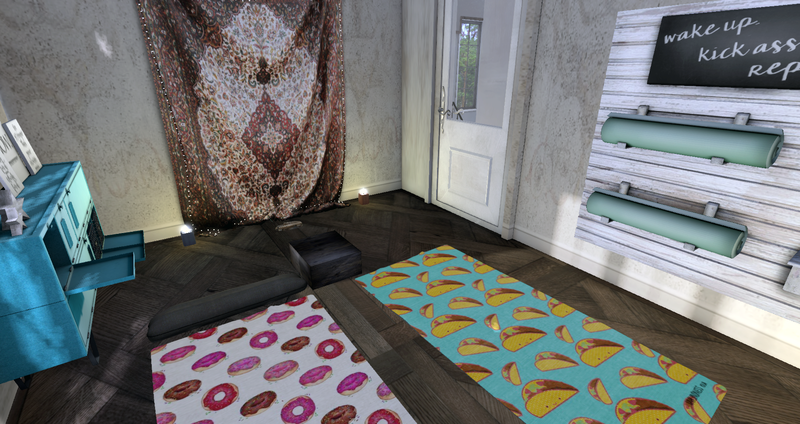 The yoga mats are from unKindness and are color/pattern change. The wall pallet and shelves are from Kalopsia, called Kali’s Shelf. 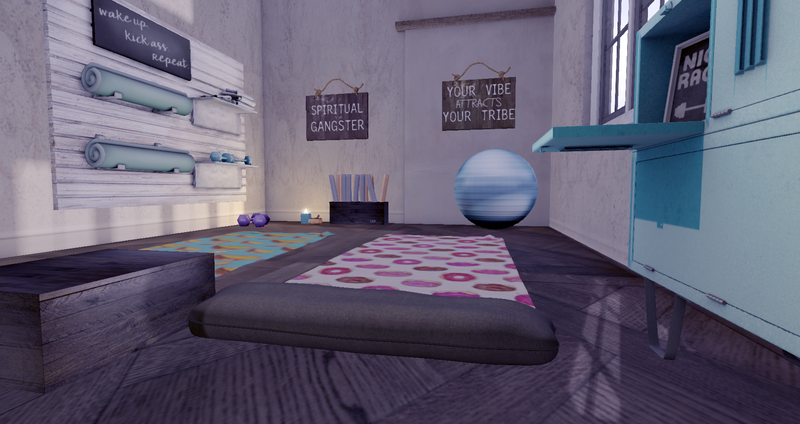 The gym locker sideboard is from Second Spaces (one of my favorite places on the grid to get knick knacks and decorative items). The candles and incense burner are also from unKindness, as are the “Spiritual Gangster” and “Your Vibe Attracts Your Tribe” signs. They were all part of their Yoga Studio Set fatpack. 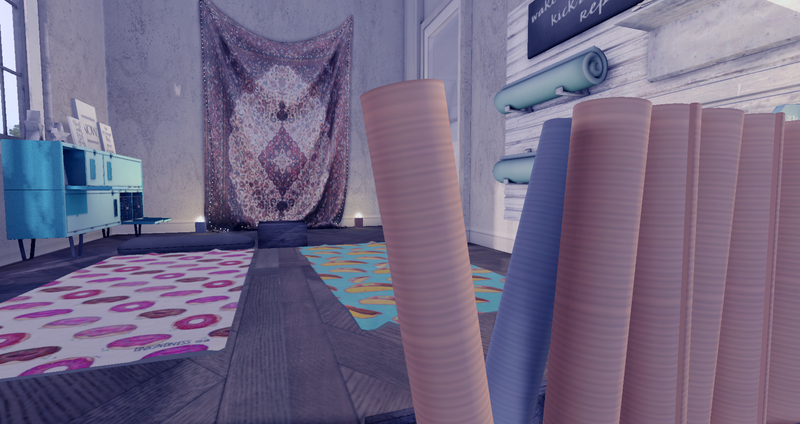 If you want to build a Second Life yoga studio, or just a relaxing space like this, I really recommend grabbing this whole pack. The loose hand weights, and the yoga ball are from Kalopsia, from the Kali’s Yoga Accessories pack. The wall tapestry is something that I have had for a while, and I don’t remember where I got it, but it is one of those “base items” that I think are good to collect. When you’re at events, or stores, little random items can really add life to a room, and give it character. I like to buy these things for when I have a project like this, because it give the room a more comfy and lived in feel. If you haven’t seen the Emily house from Scarlet Creative, it is a gorgeous piece of work. I really love the things that they do there. This is all until next time. I will try really hard to update this more often. A great post about the Alki sim, and the cool stuff that Zoidyn and Alana have done with it. PS: I play there in their coffeehouse on Sundays. Also: I didn’t write this, this is a reblog. I first visited Alki, the music and scenic region designed by Zoidyn (Zoidyn Kytori) and Alana Onyett, far back in 2013, which is Second Life terms, is almost a lifetime ago. Back then, it was described as an “evolving project inspired by the Pacific Northwest”, so I was curious to know what might have changed in the intervening years. The overall answer might at first appear to be “not a lot”: the landscape is still the same, there’s the same mix of venues, the paths are familiar, and so on. However, the region has changed in subtle ways – but that’s the point of evolution; things don’t happen overnight, they happen over time.